“We have worked four months without a paycheck! Save the workers! We want to work!” More than 500 people including fitters, welders, and crane operators claim they have not received any money for four months. That was two weeks ago, but earlier in April, 100 workers went on strike and 26 started a hunger strike. The Vostochny Hunger Games are on and Russia’s space future is at stake here. Now the workers at the construction site took to the roofs to write pleading messages to Russian President Vladimir Putin after going without pay for months. Pictures of the appeal were then taken by the employees of the JSC Pacific Bridge-Building Company (TMK) and sent to high-profile officials, including the governors of the Amur region, the editors of the local newspaper, and to the President’s office itself. TMK is one of the biggest road construction companies in Russia’s Far East. It built a cable-stayed bridge across Zolotoy Rog Bay in Vladivostok for an APEC summit in 2012. In the past several months, the company has been having financial problems. Several criminal cases have been opened against its executives. The hunger strike on April 4 came a day after Deputy Prime Minister Dmitry Rogozin said that the head of Spetsstroy Alexander Volosov flew to Vostochny “to remove the problem with the salary and negligent subcontractors.” Three hundred of the site’s 5,700 workers were said to have been owed up to 140,000 rubles ($2,500) each. 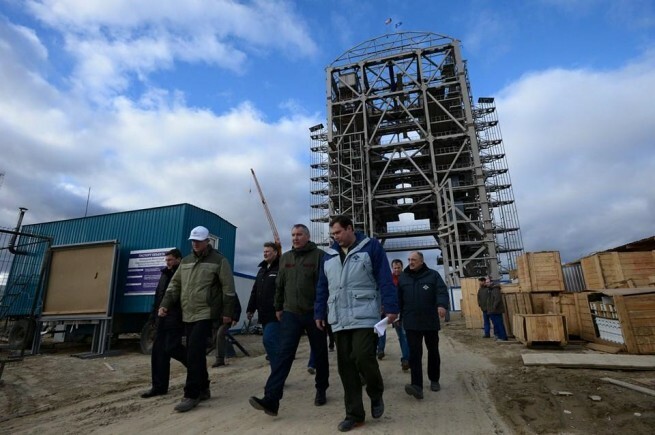 The cosmodrome construction is personally controlled by Rogozin. 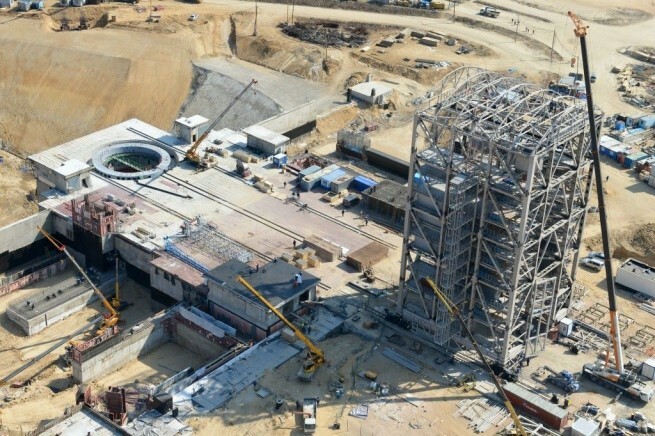 The acting head of DalSpetsstroy, a federal special construction company building the Vostochny spaceport, Yury Volkodav said on the same day that the debt was to be paid off by April 10. On April 8, investigating authorities opened a criminal investigation into the non-payment of salaries to the firm’s employees. TMK’s four-month debt to its workers was 96 million rubles (1.8 million U.S. dollars), of which only 15 million rubles (288,900 U.S. dollars) have been repaid. Investigators found that a limited liability company received an advance payment of 50.5 million rubles between November 2014 and January 2015 under an agreement on implementing a package of works at one of the spaceport’s facilities. “The organization failed to perform the work in full and provide the report documentation on implementing the works, and spent the funds for its own financial and business needs and for personal purposes,” the ministry said. Federal Space Agency chief Igor Komarov said last week that the project is as much as 120 days behind schedule, jeopardizing President Vladimir Putin’s target for a first launch in December. According to him, the technological equipment of the launch facility is 91 percent ready, the technical area is 95 percent ready and the fueling station is 71 percent ready. Komarov said his agency demanded to ensure cleanness and the required temperature in the cosmodrome premises. “We have no right to install costly equipment in the current conditions,” he said. Every postponement is a huge embarrassment for Putin, with Vostochny being viewed as the jewel in the crown of the future of Russian space missions. “You must understand that Vostochny Cosmodrome is one of the country’s key construction sites and is a national project. Keep it under your keen supervision. The deadlines set must be rigorously observed,” Putin said. He also said that he was informed about the current delays. “But a positive acceleration trend has been seen lately. This trend must be maintained. We must work to attain the plans set,” Putin said. “On the whole, the construction is seriously progressing. Already the launch pad is there and we found out that the engineering mechanics are also installed there. In fact, the fire ring is already fully assembled. In general, the building goes on. I think we are on schedule to complete it,” Rogozin noted. The Vostochny space center, located in Russia’s far eastern Amur region, is expected to reduce Russia’s dependence on the Baikonur Cosmodrome in Kazakhstan. Baikonur is on lease to Russia until 2050. It will comprise two launch platforms, an airfield, facilities for crew members’ pre-launch preparation, oxygen-nitrogen and hydrogen plants, 115 kilometers of roadway, and 125 kilometers of rail track. 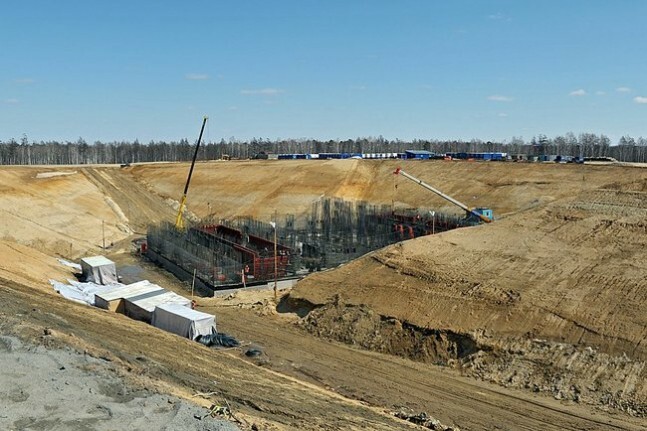 The first rocket launch from Vostochny should take place in December 2015. “We propose that the first launch will be in December of this year,” Rogozin told Putin. The first piloted spacecraft takeoff is scheduled for 2018.